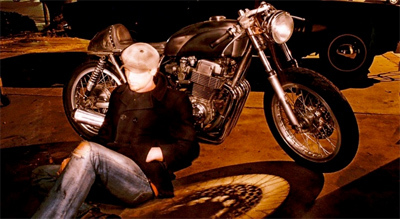 Dustin Kott of Kott Motorcycles talks about his influences, the multi-​faceted nature of bike building, and why every year he heads out to Sturgis South Dakota to bartend at one of its biggest saloons. My name is Dustin Kott. I am the owner and currently sole operator of Kott Motorcycles. I was born in So. Cal and have remained here for the last 33 years. 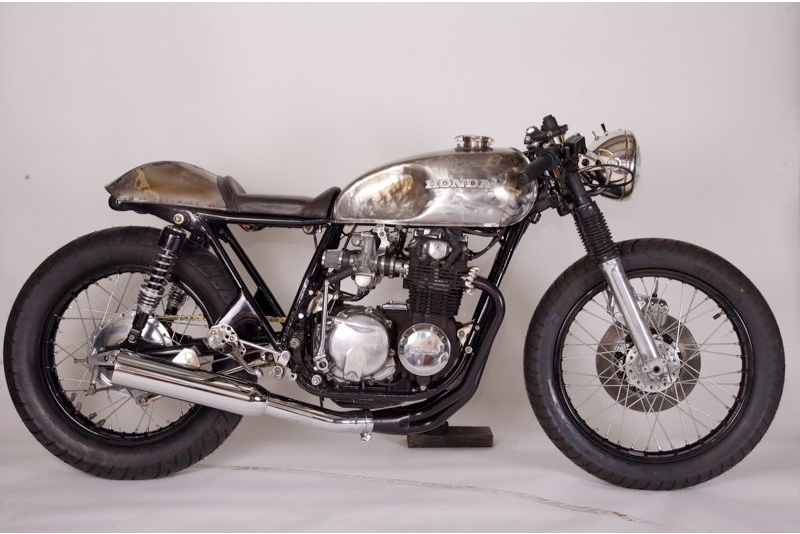 I started Kott Motorcycles four years ago as a full time business, however I have been wrenching and building cafe inspired motorcycles for the last ten years on one level or another. I have always loved all types of motorcycles, but it is certainly riding and the feeling that riding or traveling on a motorcycle provokes in me that keeps me motivated. 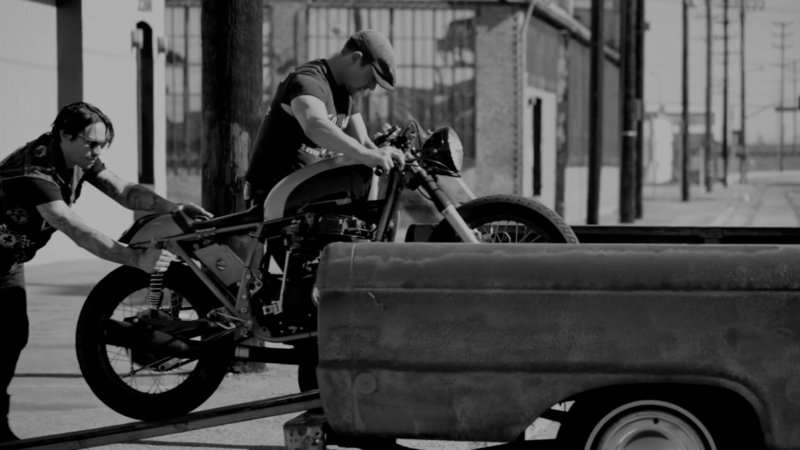 I had always said that if somehow I could have a seemingly endless supply of vintage motorcycles that I could very well make a business around building, designing, or customizing them. Shortly thereafter I was approached by a particular guy who scavenged the U.S. for any and all of the Honda SOHC CB series bikes. He had seen some of the work that I was turning out on these particular bikes and basically subcontracted me to build bikes however I wanted to and he would sell them. That was now what seems like a lifetime ago but was really the catalyst for my current business as I know it. 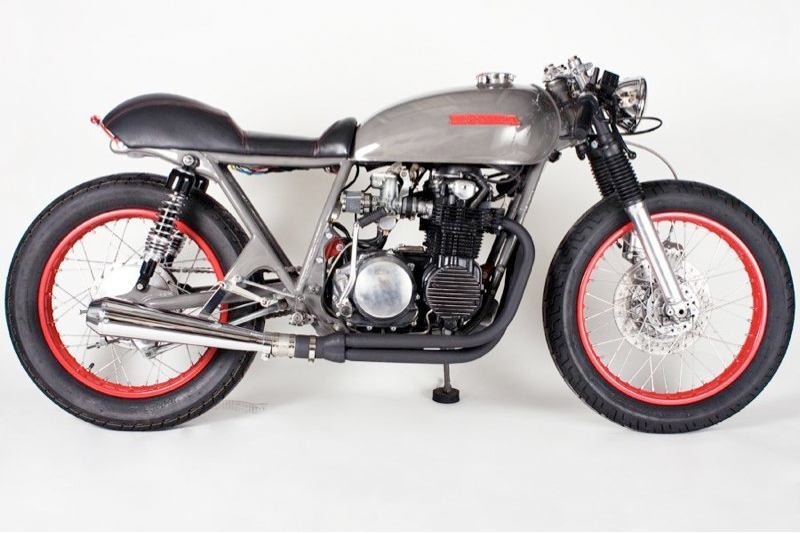 Your first bike was a 1966 Honda S90. What did you like about that bike? I really loved that particular bike because of the feeling I got when I rode it. I felt like I was on a machine that literally could teach me about life. That bike was dangerously slow and temperamental at best but the rider participation that it took to operate that machine was unparalleled with any other. The idiosyncrasies of dealing with life, love, people, and even machines can reveal to you a continual need for patience and continued knowledge. To have the privilege to participate in something that is outside of your control but well within your understanding is what makes vintage motorcycles so appealing. You once said, “As much as you want a custom bike, I want to build one. I love what I’m doing and I’m not here to shake you down. We do it once. We do it right.” That captures a lot in one statement. Where did that come from? There is a wall of quotes in the shop that we continually add to as we see fit. It is more of a philosophy wall that reminds you as you are about to throw a tool across the shop or be tempted to cut corners on a build, that you have a greater responsibility to yourself, your client, and a machine that deserves your careful attention. I never started working on bikes to make money. I am aware that this statement sounds relatively altruistic but in the end I simply try to make enough to cover overhead, upcoming builds, acquisition of project bikes and enough to take the girl out to dinner now and again. The truth of the matter is that I work within; if possible, the monetary confines that any particular client may have. I will say no from time to time if the project just simply cannot be funded, but I always want to make sure that a bike comes out spectacular and not just mediocre or status quo. Waking up every morning and having the once in a lifetime opportunity to build custom bikes as your living is just about worthy of paying to do..getting paid to do it is just a bonus. When you’re out there finding bikes to refurbish, what details are you looking at? Can you pick-out a potential diamond-in-the-rough fairly quickly? 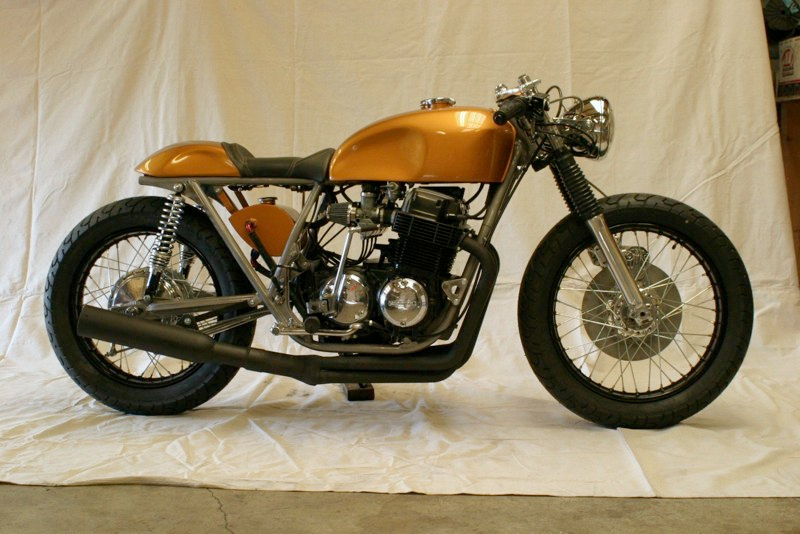 The process of finding project bikes has changed to an almost unrecognizable pastime. The acquisition cost has literally tripled in the last three years and the supply/demand quotient is ever changing. The reason that I and others use Honda motorcycles as the platform for a custom build is that the superior engineering and the tolerance for neglect is simply unmatched comparatively. Finding the right donor bike involves one simple philosophy..find one that is dirty, low mileage stock and start chopping. 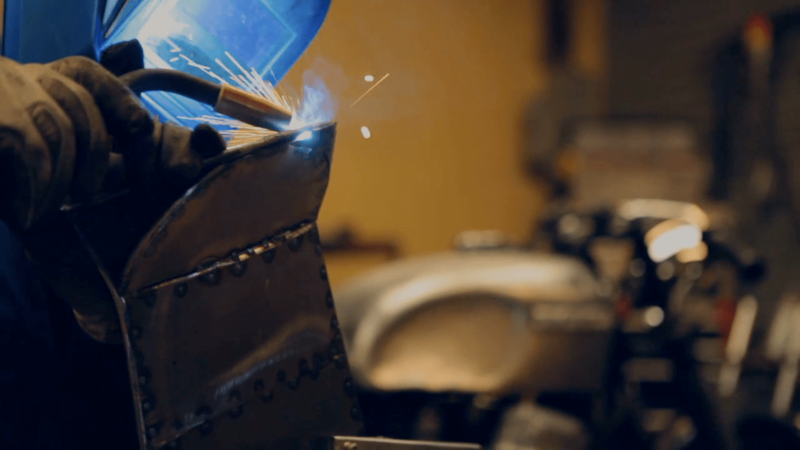 What’s your process for building bikes — strict pre-planning or going making it up as you go? The process of building a bike for me is extremely free flow. There is always an idea of something that you want to do and that idea reaches fruition when it sees fit to present itself. The lack of rigidity or tedious pre-planning in my opinion will only add to the creative aspect of any build. There are obviously rules that must be followed but they are just mechanical or mathematical common sense and don’t seem to dictate the imaginative process too much. How would you describe to someone the quintessential Kott Motorcycle’s look and feel? Long before I ever heard the term “steam punk” or had an understanding of what it meant, it was a term that people often used to describe the look of the bikes that my shop has turned out in the past. I think that term was used due to the simplistic, sometimes rustic, and bare bones approach that is rigorously practiced at the shop. We also introduce metal plating as one of the trifecta of colors that end up on the finished build. I have always thought that having three colors/textures on a build really completed the finished product and added a congruence and continuity. When using a metal finish as your third color; copper, brass, nickel, bronze; chrome; or antiqued/rusted steel, a look unlike paint is accomplished. There has been a certain recognizability with the bikes that are built at my shop. I think it is because there are no two alike. Each bike is a one at a time experience with mostly hand crafted components that I cannot even replicate. The silhouette of the seats, the rear set design and the leather and stitch patterns on the upholstery stand out to me the most and I believe others as well. What details do all Kott Motorcycles have in common? Now that you’re established, is it easier to work with new clients? 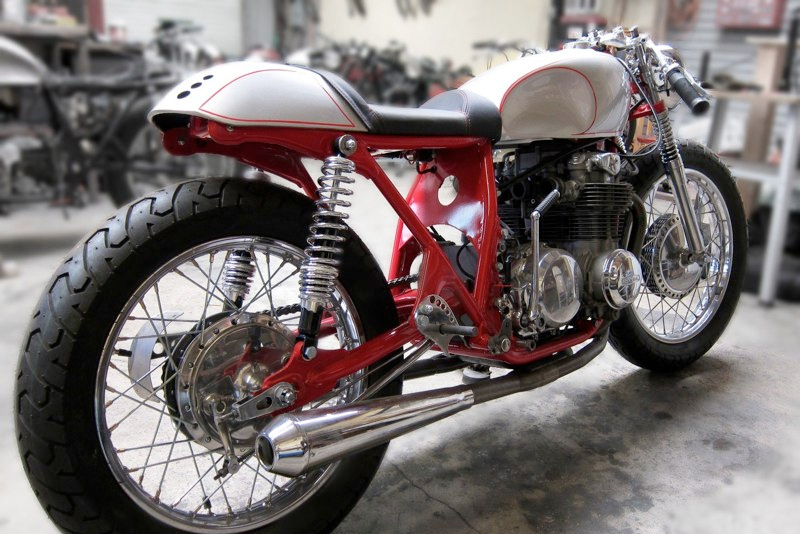 Due to the almost familial nature of the cafe racer scene in L.A. has allowed a word of mouth style of advertising to take hold and propel Kott Motorcycles to a recognizable name in the scene. As a relatively established shop at this point I have found that it has become easier to aspire to taking on only the projects that we would like to tackle at the shop. Kott Motorcycles did not come to exist in order to be a lube and tune style shop. The preference of work is to be able to start over with any bike that enters the shop and to completely customize or alter the machine into something more suited for its environment or to the riders taste. To essentially make a forty year old motorcycle as brand new and custom fit as possible..not just to change the oil and make it run..although that is part of what we do. With a slight bit more of an established name we are now able to select and choose the projects that we would like to have a hand in, not just taking on anything to keep the doors open. The policy at the shop however is to answer any and all questions and offer any help regardless of earning a clients business or not. You seem do a lot of metal fabrication. What advantage is there over off-the-shelf components? It has taken a number of years to really hone in on exactly what takes place most at the shop. What I mean when I say that is that there are so many avenues traveled in building a custom bike that you become nearly a jack of all trades. Becoming a master of one is nearly impossible with the multi-faceted nature of bike building. The one thing however that I have realized is the amount of metal fabrication that takes place at the shop. I have found that we take on jobs in the neighborhood that have nothing to do with the business. We have welded together shovels and barbecues, pounded out dents and made small specialty tools for walk in clients. All this to say I realize that we focus on metal work and one off designed parts. The advantage of designing and making your own parts is the unique nature of each individual piece. No two bikes are ever alike that leave the shop. In this eclectic world of custom motorcycles I believe that this concept is of great value. Most people who have a motorcycle view their bike as literally an extension of themselves or even a significant other. No one likes to think that they are run of the mill or insignificant.. or that anyone else is also enjoying the company of their significant other. Therefore I believe that truly one of a kind “art” or exclusivity is superior to dime a dozen stamped or massed produced parts. How much CNC fabrication do you bring into your bikes? How have these automated machine tools changed the business of bike building? I can at this point only imagine the advantages of using c.n.c equipment in my shop. There is a certain frustration that arises when you realize that the limitations are not in ideas or enthusiasm but literally in the several thousand dollars that are lacking for a certain tool or machine. I have recognized the value however in being able to overcome tooling short-comings. The collective ideas and camaraderie that come from brainstorming and problem solving in the shop seem to make every project memorable and constructive toward future projects. Many hands do at times make for light work and a lot of think tanking. You remove a lot of weight from your bikes when you refurbish them, what unnecessary parts are you removing exactly? No doubt that it helps performance, but is it also about the stripping away the ugly? The concept of any machine starts with the essentials. As the essentials and necessities are met, the idea of the machine now starts to change. These changes seem to take the face of comfort, dependability, marketability and user friendliness. 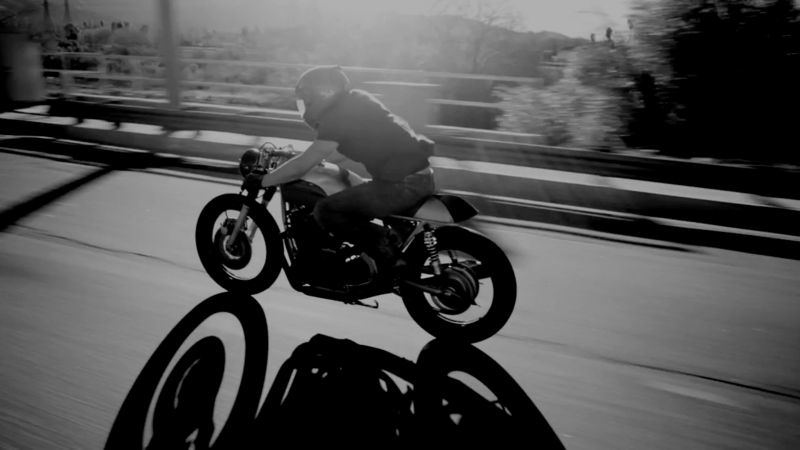 The concept of the cafe racer thrusts the owner/operator back into the mind of the original creator. The only matter at hand is mechanical efficiency/simplicity. The comfort or street legality are obvious after thoughts with ultimate mechanical performance and efficiency in mind. 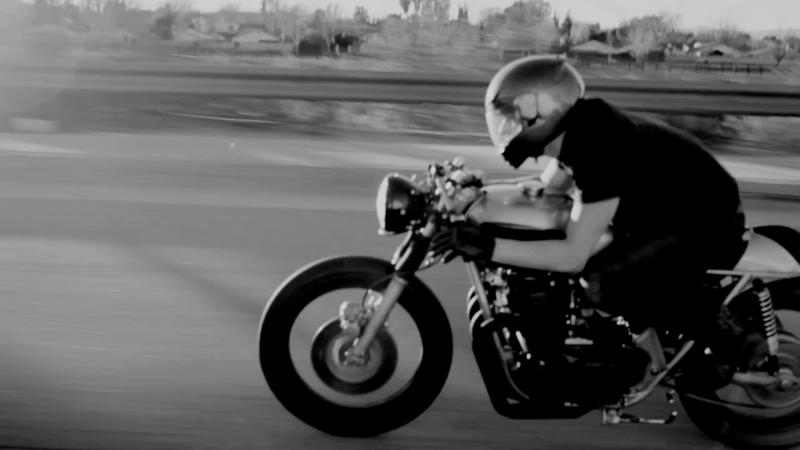 The cafe racer seems to be a harmonious blend of these philosophies; incorporating a thoughtful ergonomic riding position while allowing the machine itself to be rid of all that is cumbersome and unnecessary. While the motorcycle was originally intended for the specific uses of the rider, the cafe racer promotes ultimate operator participation in so much as the rider can always determine what is deemed fit for any and all riding and performance conditions. Besides your own motorcycles, what’s the best bike you ever rode? What about it make it the best ride? At this point in my life I have ridden so many different motorcycles that it would be nearly impossible to choose a favorite. 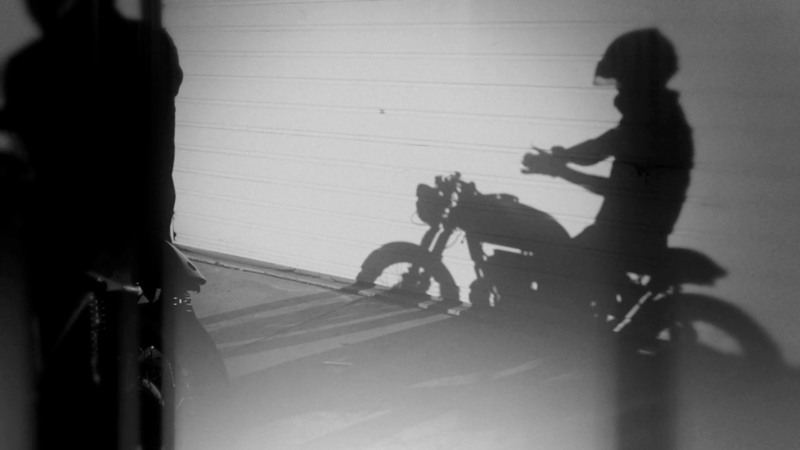 I truly believe that motorcycles are like different moods in life. I have ridden dangerously fast through some precarious canyons on a yamaha R1 during a breakup. I have ridden with a smile of contentment on my face through the hill country of Austin Texas on a dynawide glide with a girlfriend on the back. I have ridden a Triumph Bonneville with a shirt and tie to church on a sunday morning. I am not sure that I will ever have a favorite bike . That would be like asking what is your favorite mood.. It takes one to appreciate the others. What skill-set would you like to improve on? Of the multitude of skills that can be developed during the bike building process I think that shaping and welding metal are certainly my favorites. There are several skills that I would like to improve on. Tig welding aluminum is a real art and one that I want to learn to do well. Only the most patient of craftsmen can really correctly weld aluminum and still make it look professional and sanitary. Shaping metal is another skill set that is of upmost importance and interest to me. 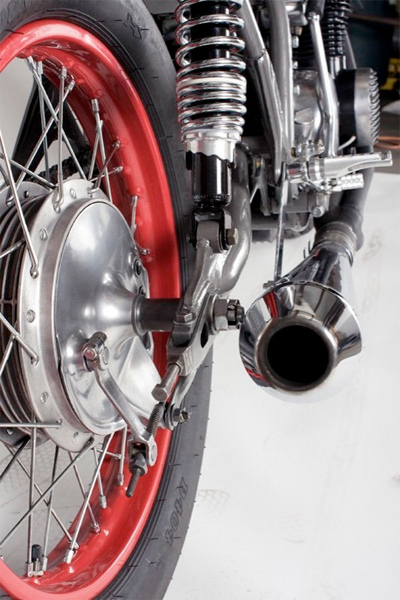 The use of aluminum on motorcycles is essential to continually reduce weight. Aluminum is also a superior metal for shaping purposes. The making of fuel tanks and fairings is something that I really feel I need to be able to produce in the near future to be a more well rounded craftsman. Best road your ever rode? Best road to ride in your zip code? My favorite riding has always been long road trips. My favorite ride to date was from L.A. to New York in 2006. We stayed on I-40 and old route 66 most of the way. I have always enjoyed the participation with the road and the elements and the freedom of long trips. They are especially meaningful when there is no real plan on any given day. Some of the best roads in California though are right in the back yard of the shop. In the northern part of Los Angeles county we have roads like Angeles Crest Hwy I-2. We also have bouquet and San Francisquito canyons that are legendary rides. What music/band are usually playing in you garage? It seems as though music has always been a staple with the motorcycle enthusiast community. Without some great tunes in the shop things seem to get a bit stagnant. I find that different bands and genres of music have come and gone and then come again through the years at the shop. I have always loved any of the early west coast punk bands; Bad Religion, Black Flag and Social Distortion have always been staples in the shop. Depending on the mood you can often hear early Kiss, Danzig, Motorhead, Bob Seger,Johnny Cash and Creedence. We have been known to pepper in a little Gordon Lightfoot from time to time and Morrissey has always been a favorite. I think that music has and will always influence the counter culture/hotrod/motorcycle lifestyles. What specific British motorcycles were you inspired by? If push ever came to shove with the question of inspiration or influences from different types of motorcycles I would have to say that the majority of influence comes from early American board track racers From the early Indians, Harleys, and Hendersons. I would say that those are my absolute favorite bikes. The British influence however stemmed from the early commandos that Norton produced. I think the Norton still has one of the absolute best exhaust sounds of any motorcycle. I always appreciated the relatively stripped down approach that early american and british motorcycles seemed to incorporate into the overall design. Less was and still is more. Favorite bike movie of all-time? If I had to choose a favorite biker movie the toss up is between Mad Max or The Wild One. I really dig the cafe influence of all the early Kawasakis. I realize that the cafe influence seems to repeat itself through history but never seems to fade away at all. The idea is that functionality is always cool. Wild one is a great movie too. It has an overly sensationalistic vibe about it but is just 50’s/60’s cool. I have always thought that Brando was a legend. What’s the best thing about having your own business? Downside? The best thing about running my own shop would be difficult to narrow down to any singular aspect. I truly love the fact that I am able to make a living doing something that always puts a smile on my face. To be able to design and create custom motorcycles that me and the client love. The idea that you can understand the start to finish details..to be able to see something finished before you even start. To create your own rules because there were none to follow in the first place. Even though I have not experienced any real downside to running the shop..I know that at one time I was hesitant to make my hobby/passion into a profession. The hesitation stemmed from the idea that being forced to produce or create as opposed to letting the inspiration do the work would somehow make the whole process ugly. I have not found that to be the case because of the rule in the shop that we do not do the same thing twice. What do you like to do when you’re not building bikes? Even though I find great therapy and joy in the bike building process there are other avenues in life that are great as well. I always like to mix up different gigs that I do for cash. Every year for the last six I have been heading out to Sturgis South Dakota for the biggest motorcycle rally in the world. I am a bartender at one of the biggest bars on Main Street for about twelve days of absolute mayhem. In the years of heading out there as a spectator I have seen the cafe racer influence completely change the custom building community altogether. The days of the traditional chopper will undoubtedly return but they seem to be fading fast while being replaced with smaller more agile and stripped down machines. Other interests outside of bike building include staying involved with playing guitar whether on my own or with bands that I have played with off and on for many years. Still the best of activities involve motorcycle trips or shows that we all collectively ride too and enjoy the hell out of. Inspiration still comes from trial and error in the shop. I feel though that due to the continual involvement of friends and fellow builders inspiration seems to flow more efficiently if that makes sense. After having done something new with every build that enters the shop I feel like ideas grow exponentially and we can’t wait to try something new on the very next project. Inspiration also seems to build from the continued and growing participation from those who have taken an active interest in the shop and our upcoming projects. I cannot thank the fans of the shop enough for the motivation and support.